Dr. Michael Farzam of House Call Doctor Los Angeles is delighted to be providing the kind of urgent care Calabasas residents have long wanted but have mostly assumed no longer exists. One of the very few house call doctors working anywhere, Dr. Farzam is delighted to let San Fernando Valley and Greater Los Angeles area patients know that medical care is now only as far away as their phone. Whether you need urgent careat your home or office in Woodland Hills, Canoga Park, or anywhere else in Greater Los Angeles, including the Westside and Downtown Los Angeles, Dr. Farzam is providing the kind of personalized, friendly medical care that actually comes to you. The West San Fernando Valley is an exciting and affluent area filled with many busy people involved in a wide variety of activities and businesses. The kind of urgent care Calabasas residents and others might require can arise in a thousand different places and times. 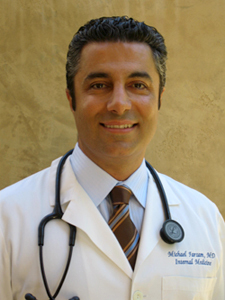 For people who can't take time away from their hectic careers to look after a chronic health issue, or for people who find themselves ill and would prefer not to stress themselves out by driving through area traffic, only to wait for hours in a standard clinic for a possibly indifferent doctor, house calls from a caring physician like Dr. Farzam truly are the perfect solution. Taking advantage of Dr. Farzam and House Call Doctor Los Angeles can make financial sense as well as medical sense. It might surprise those who suddenly need the assistance of on call doctors to find that a house call to your home, office, film set, or any other location can often cost a great deal less than a visit to the emergency room. With House Call Doctor Los Angeles, urgent care in Calabasas or anywhere else in Greater Los Angeles never needs to be an ordeal. For further information call 310-849-7991 today or visit our contact page.